Recently, I got a request from that famous singing group, Tina, Tyler & Ellen, to explain how I go about my street photography. I love street photography because you never know what you are going to get (if anything) and you constantly have to adapt to changing lighting conditions, subjects and backgrounds. If you look at the labels on my blog, you will see that street photography has 86 different posts which ties it with environmental portraits as the most posts on my blog. If I was consistent with my labeling, I believe that street photography would have considerably more. To me, there two essential elements to a successful street photography image: interesting subject and separation of the subject from the background. Interesting subjects come in all sizes, shapes, colors and ages but what I try to do with all of them is to emphasize what attracted me to them in the first place. A great example of how I did not do this is my December 21, 2009 post. 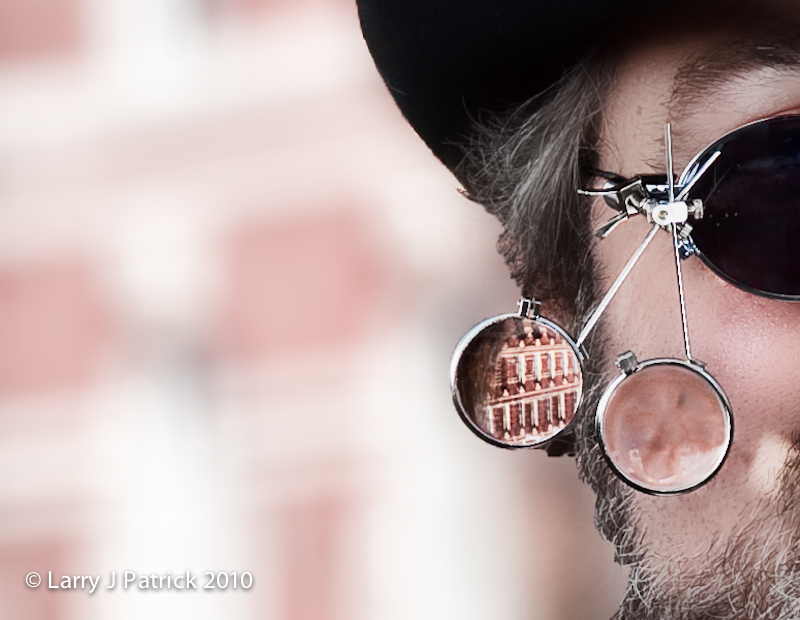 In the full frame version of the photo, I did not hone-in on the glasses; consequently, the photo is very ordinary. Even the cropped version is lacking because it does not fully capture the unusual nature of the spectacles. So, my first rule of street photography is to find a subject that interest you and make your photo about exactly what attracted you to the subject. Separating the subject from the background can be done several different ways: shooting subject against a simple background, using shallow depth-of-field, under or over exposing the background while properly exposing the subject, shooting subject from an usual angle, etc. This is one of the parts of street photography that makes you continually adapt. Unfortunately, I cannot give you a formula as to which approach will work best in different situations. The photo posted today is a revision of the one I posted on December 21, 2009. If I had shot this as I should have, I would have used an f-stop of f/2.8 (rather than f/9.5) which would have completely burred the background and slightly blurred his face. Additionally, I would used a shutter speed of 1/60th of second which would have overexposed the background by about 1 ½ f-stops. I tried to simulate these differences using Photoshop CS5, but I must admit, the result is a very poor substitution to shooting it right to begin with. But, I think you can better understand what I should have done. Next post, I will describe how I try to get this result in the camera. Thanks for doing this. But, I was hoping for more how do you do it rather than what you try to do.